The intensity of a horse’s respiratory effort during a race can cause bleeding in the lungs and affect performance. This creates specific nutritional requirements in horses. 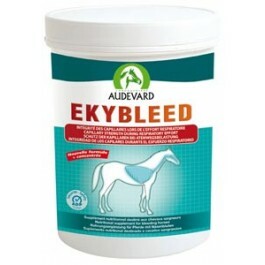 Six carefully selected plants make up over 90% of the daily measure of Ekybleed. This concentrated formula has been specifically developed for racehorses and has no doping effect. Analytical constituents:Humidity <10%, 8.7% crude protein, 10.5% crude ber, 2.2% crude fat, 9.6% crude ash, sodium 0.01% . Nutritional support to prepare for increased respiratory effort in sport-horses. Daily allowance:1 level measure per day for 2 weeks. Ekybleed can be given all year round. Redplex Booster is a complementary feed formulated by AUDEVARD Laboratories. It is designed to provide additional nutrition for horses in training and competition, as well as those that are underperforming.